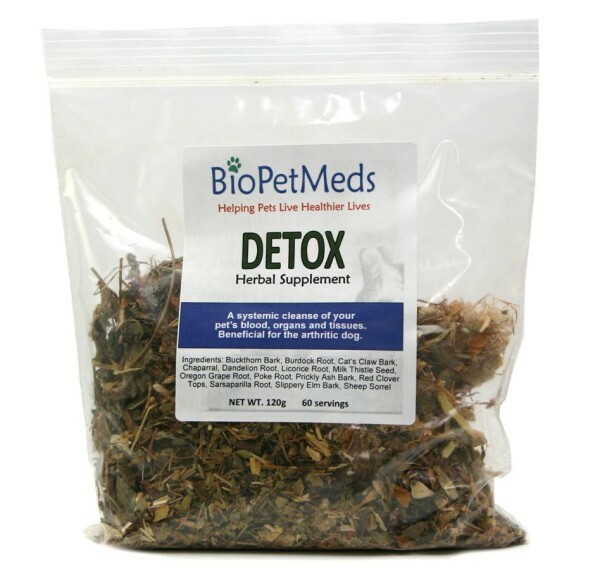 A systematic cleanse of your pet’s blood, organs, and tissues. Beneficial for the arthritic dog. Divide daily dosage between morning and evening feedings when possible. For pets with chronic arthritic conditions, maintain dosage daily. For pets with chronic hot spots, maintain dosage for up to 1 year. There are two ways to administer: as a ground herb; as a liquid. INSTRUCTIONS (Ground Herbs): Grind the herbs to a fine consistency. Return the ground herbs to the bag and seal until ready to use. Sprinkle ground herbs onto food according to Recommended Daily Dosage (ground herbs). Extra herbs can be stored in the freezer to maintain freshness. INSTRUCTIONS (Liquid): Bring 4 litres of water to a boil. Remove from heat. Add in all the herbs. Stir slowly making sure all herbs have been submerged in the water . Simmer on low heat with lid off. Do not let mixture boil. Stir occasionally and release any herbs built up along side of the pot. Simmer for 2-3 hours until the mixture reduces to approximately 2.5 litres. Let cool. Strain and store in a glass jar in the refrigerator. The herbal liquid can be mixed into food or water according to Recommended Daily Dosage (liquid). This information is for educational purposes and should not be used for the diagnose, treatment, or prevention of disease. Check with your veterinarian if in doubt. "My beautiful little pom was suffering and I felt helpless. That was until I met Penny Hunt and tried BioPetMeds medicines. I initially did a detox (from BioPetMeds) to purify his system of all the pain meds and toxins, I then started him on a raw food diet and incorporated the 'magic juice' (Joint Support Liquid Glucosamine Supplement). Within 2 weeks I had a new dog, within 3 months he had more energy than he did when he was a puppy."